There is a third base plate. Sorry for the poor quality of the picture. A better one will be welcomed. Slightly better, but not by much. I've got to confess that I don't really like racing / record cars, they're OK, but I always preferred stuff I could see on the street, so how to explain that 23e SPOW was always one of my favourite Dinkys? 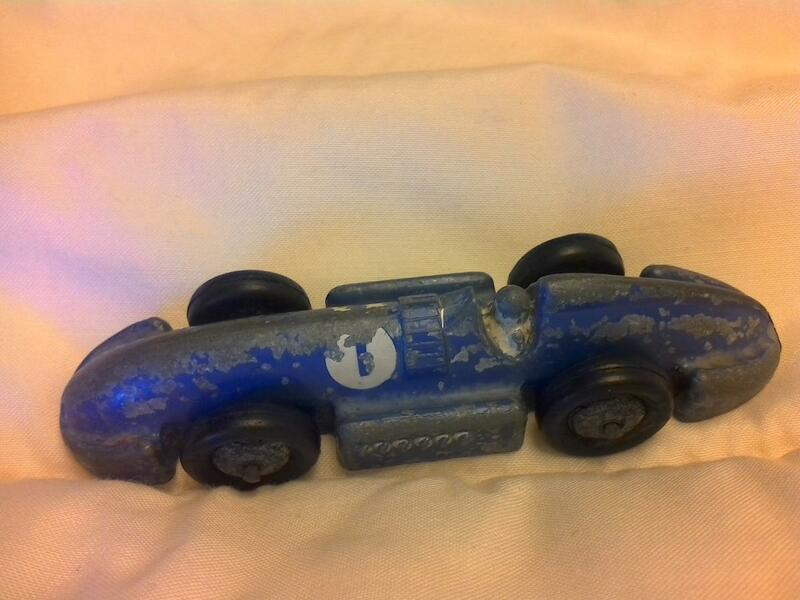 Neither Pre War has a base sadly, but racing No backgrounds are white and silver. Many thanks for the picture which is not so bad after some Photoshop treatment. Hi all, I checked my silver post-war examples of the Speed of the Wind and these are the results (top-down = earlier-later). Note the differences in hub colours, tyres, axle ends, base plates and shades of brown of the driver. Remarkable to see that the mid example's base plate holes do not exactly match the positions of the rivets. Until I found the all red with silver wheels no. 22e Speed of the Wind (below) recently, I wasn’t aware of the possible combination of an (old) moulded base plate with (new) round axle ends. In my opinion the round axle ends exactly coincided with the new flat base plate, as re-introduced in June 1952 (see MM of that month). This one must be a kind of early 1952 hybrid, preceding the ‘official’ new silver one with red hubs, grey tyres and flat base plate, which was available from 1952 to 1956 (later no. 221, still always marked 22E on the base plate). Darker brown driver precedes lighter brown driver. Black wheels precede coloured wheels. Herringbone tread tyres precede black round tread tyres. Black round tread tyres precede grey round tread tyres. Moulded base plate precedes flat base plate. Crimped axle ends precede round axle ends. 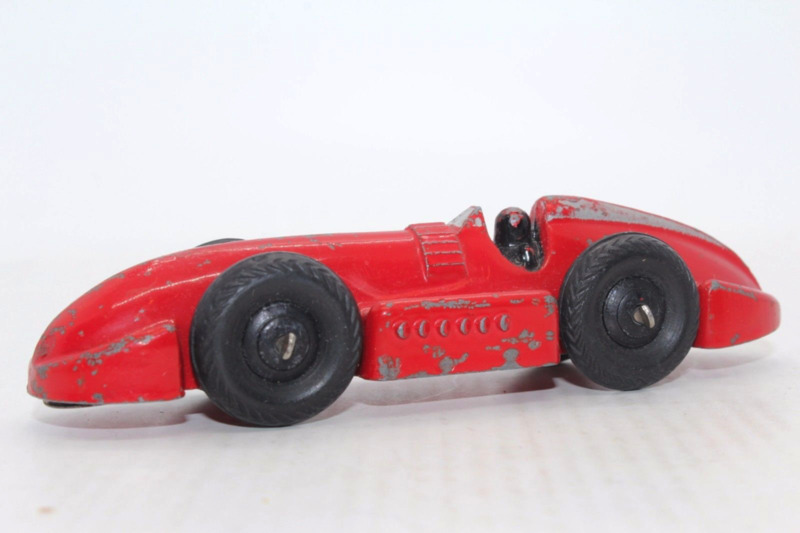 I just received a very nice early post war version of this record car, and am very excited to share it. I bought this a couple of weeks ago, and when I saw it listed, I made a quick decision that I had to have it, as it was a bit unusual. 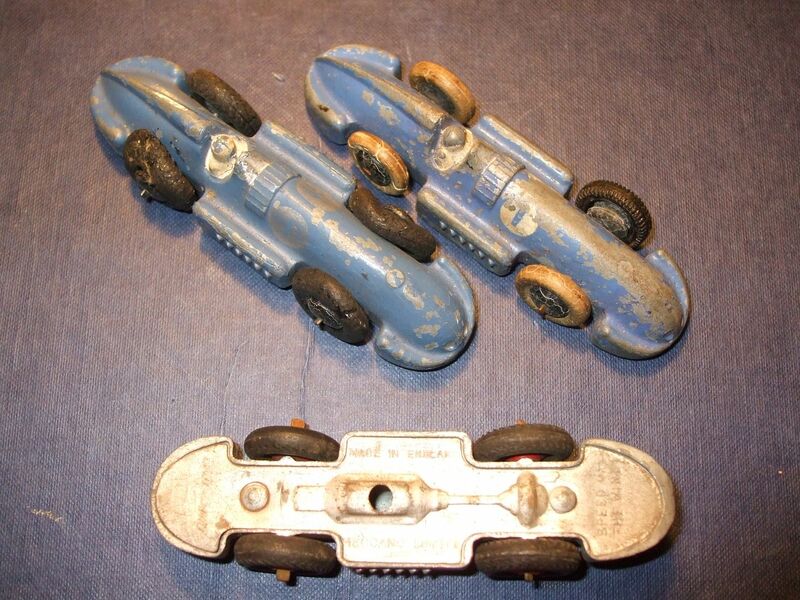 It has to be a very early issue right after WWII as it has both smooth wheels and white herringbone tires. Another likely early indication is the driver....most of these I have seen tend to be tan or light brown in color. This one is black, and I am sure it has not been re-painted. 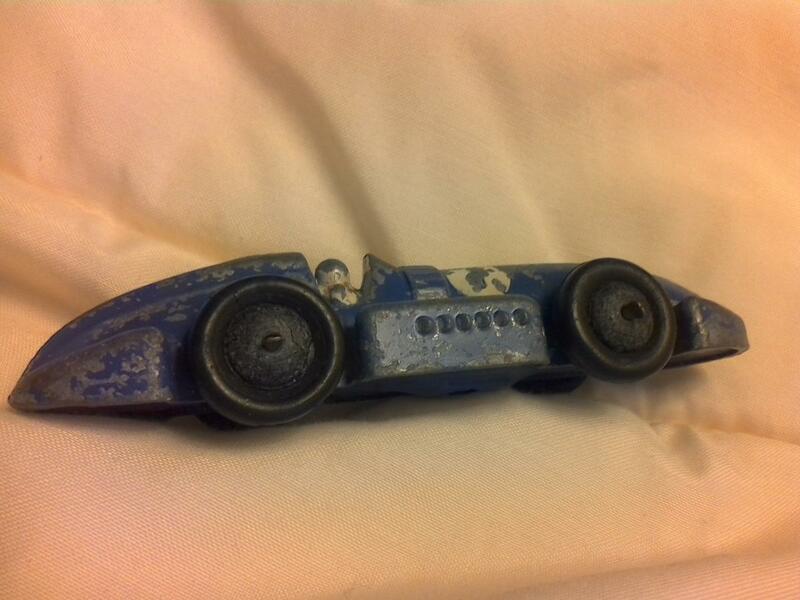 The overall condition is very good, with some surface wear and a few chips, but I am excited to find another nice post war example of the 23 series of racing cars. here is another 23e Speed of the Wind with black driver, this time with the post-war ridged hubs and black herringbone tyres. Jan----Thanks so much for your always appreciated comments. I do believe that this model had to be made very early, after production resumed following the shutdown during WWII. The white herringbone tires are likely left over pre-war stock being used up, and I am guessing the black driver was also short-lived, then changed to tan or brown shortly after. I am really glad that I saw this and quickly bought it. One of my friends bought a Red Speed of the Wind at the November Sandown swapmeet. It was much heavier as my own models. 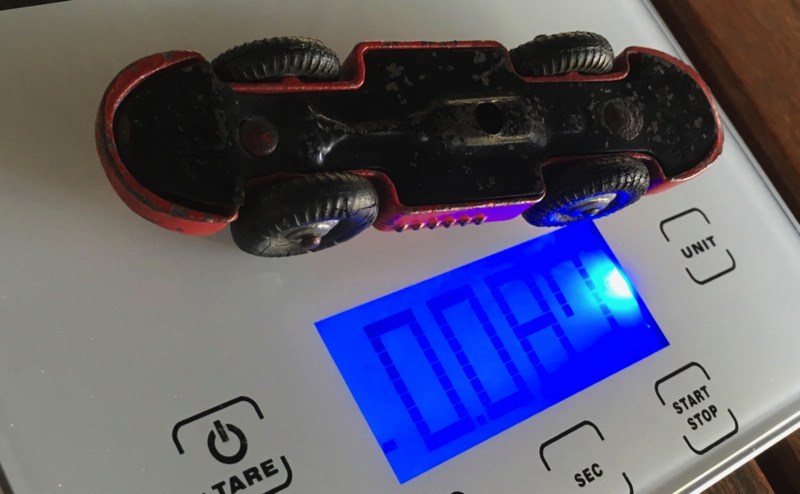 So we weight it and the weight was 84 grams were a standard model is 58 grams. The model was sold as being lead by a well known dealer. 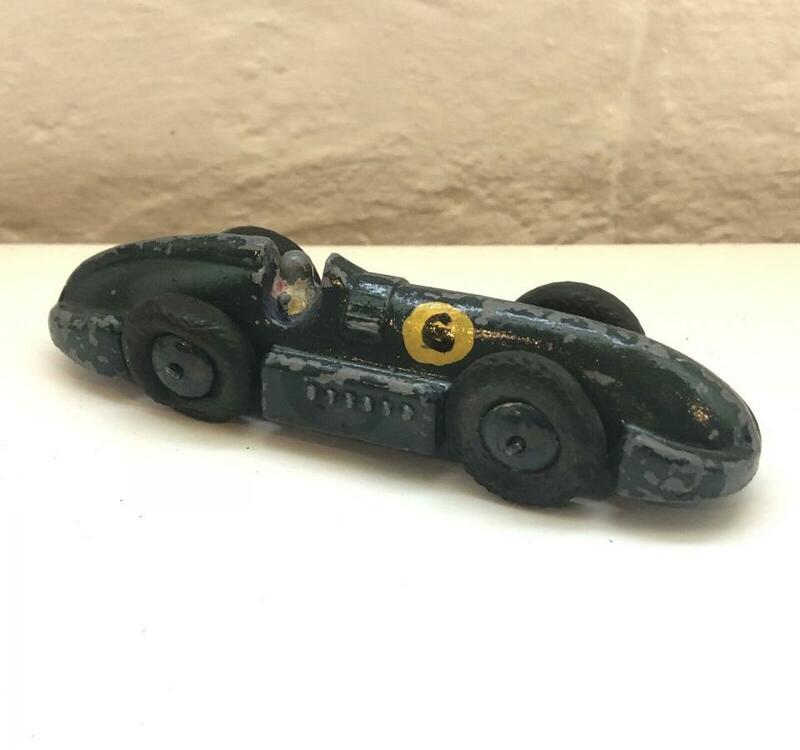 I know that many pre war models were made from lead but this was unknown to me. As I have the original drawing of the model in my collection I was able to bring some light in this. On the drawing, Job no 10255 you can read material zinc-base alloy. There is a issue 4, change order 3379, date 12-3-52, alternative material. A second Job no can be found on the drawing as 10255A, material lead-alloy grade 2. During Korean war there was a shortage of zinc and other metals so Meccano used alternative metals such as Aluminium, Vulcan and Studebaker tanker, and also lead alloy for a short time. From the drawing and the baseplate we can conclude that this model was produced in lead-alloy only for a short time, probably only in 1952. I include some pictures of the model, colour red, silver hubs and black baseplate. As far as I know the Speed of the Wind was not produced in lead before 1940. If anyone also has this model in lead please let us know. Possible more models were produced in lead-alloy. The drawing of the Speed of the Wind can also be found at the Forum, search drawings. 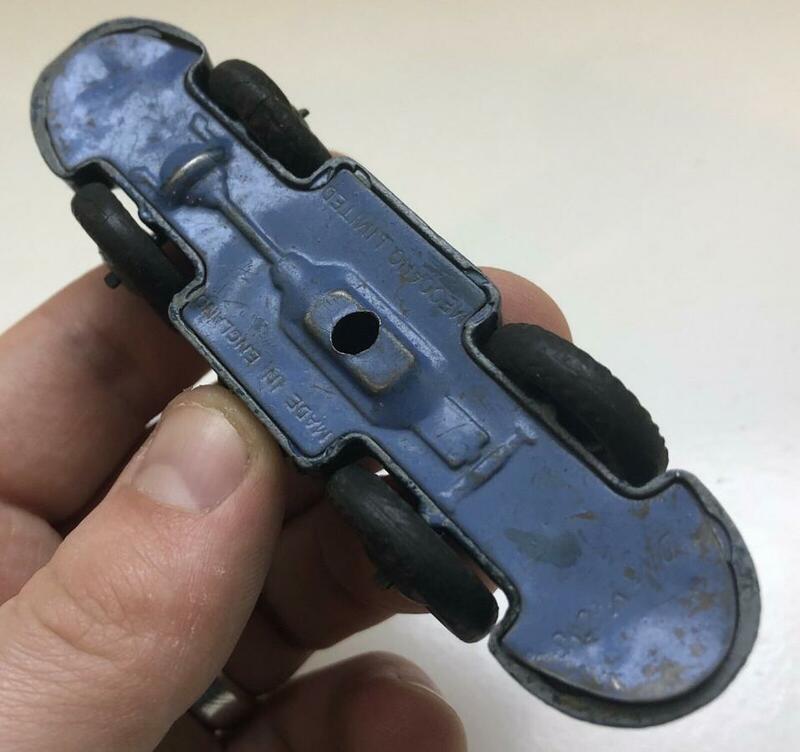 John----A very interesting find, and as Jan pointed out, verifies that Meccano was likely struggling some with Korean War metal shortages, and trying alternatives such as this. So nice that you also have the drawing to verify with! Hi John, just saw your comments and pictures on your lead 23e Speed of the Wind. 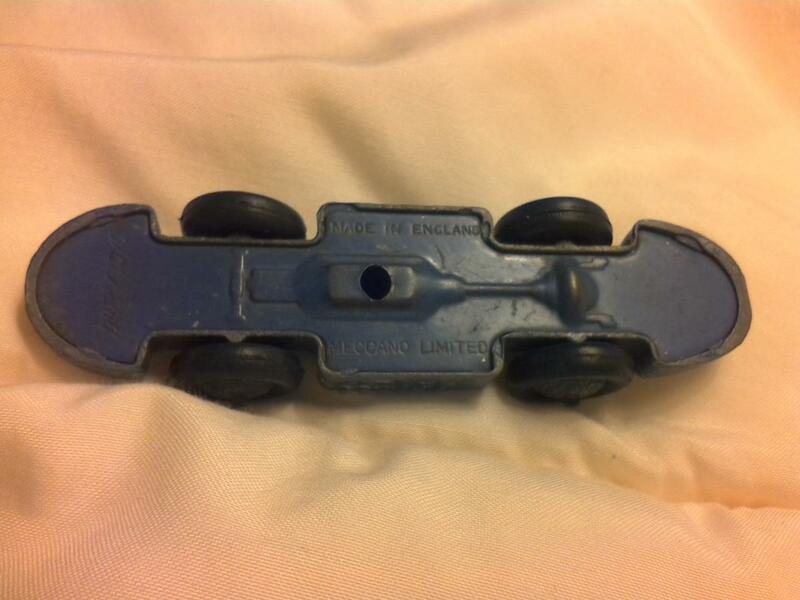 I have the same in my collection, same color scheme, same weight, same ingredients of an early 50s issue: ridged hubs, rounded axle ends, baseplate without the two little "angel wings" behind the rear axle, round DINKY SUPERTOYS tyres. But the funny thing is; on my model the baseplate has been mounted the wrong way, meaning the differential is under the front axle! Most likely a mishap, since the rivets are no doubt original. How about your model? 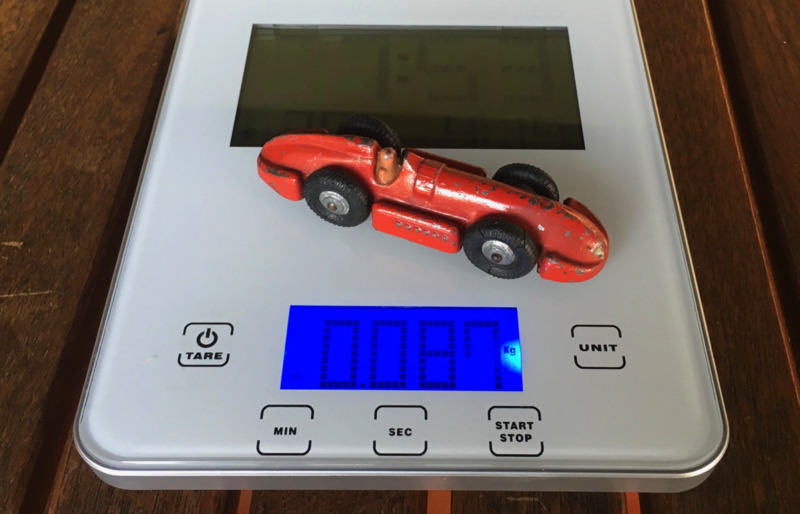 I checked the baseplate of the lead Speed of the Wind at my friends collection as it is not mine. On that model the differential is under the rear axle as it should be. So your model is for sure a factory error and thus not common! Nice find. I am back again but not in very good condition. I have started to look at the questions on the forum and can make some cmmentts on some of them. If the speed of the wind was cast in lead there is no reason why the other cars of the 23 series were not. Has somebody the drawings ? I would welcome a large copy of the front wheel drive speed of the wind and it's base plate. Hey Jacques, are you back? Here are two pictures of my front wheel drive 23e Speed of the Wind. Nice to see you here again. We have missed you too long. 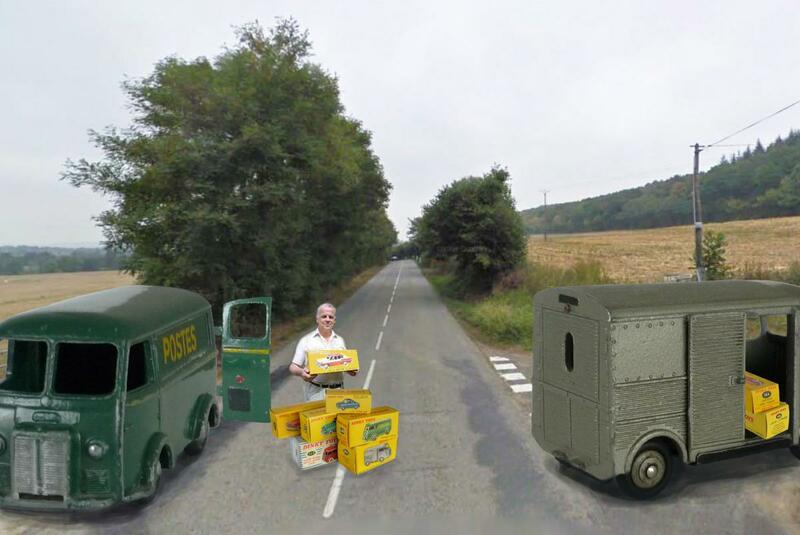 Your comment on Dinky matters will be very appreciated. Happy to see that you are back in business! Hope you'll get better soon! Jacques---I also wanted to take the opportunity to welcome you back.....hope to see more of your contributions again! P.S. : Sorry not to have seen Jacques since his recent comment here, 29 March! Thanks, Jan, for your comment. Further evidence regarding the production date of the leaden 23e Speed of the Wind can be found on the factory drawing (see publications/documents), where march 1952 is indicated as the date for the use of alternative material (lead alloy). Here is my latest acquisition. An early 23e with the 'peened in' base plate. The body is very good with no obvious fatigue although the wheels are suffering a little. The tyres are non-original as far as I can tell, they have no tread but an obvious mouding mark around the circumference. The paint is as you see not great but the racing number panels, and one of the numbers, are still evident. I was the only bidder on the well-known auction site and got it for a very reasonable price. It's not great but I'm very pleased to have it. Somebody must have had great fun playing with it, John! 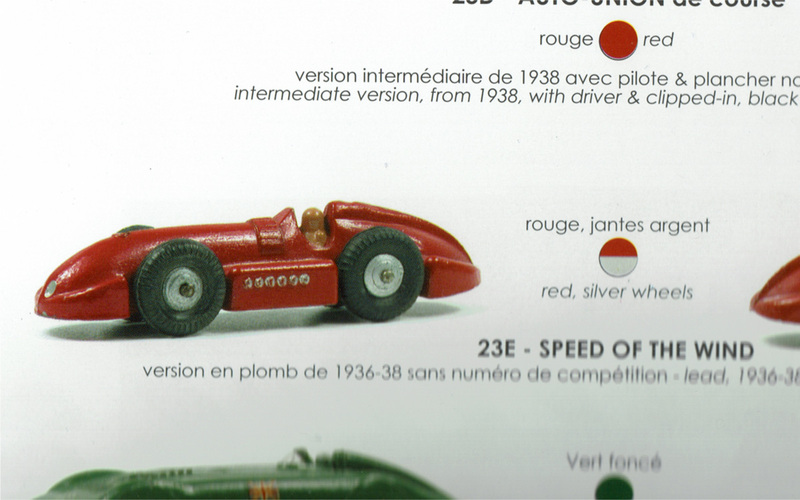 the 23e Speed of the Wind was introduced in May 1936 (Meccano Magazine), first without racing numbers, then with racing numbers, like yours. Take good care of it. Thanks Jan, do you know when the name was introduced? Walter, thanks for that information. I was delighted with it when it arrived as it was even better than I imagined it would be. The baseplate is not damaged at all apart from a small scratch and some rubbing on the engine sump and differential. The body edges and the ridge on the tail are still crisp and the nose and tail show no damage so whoever played with it they treated it gently. 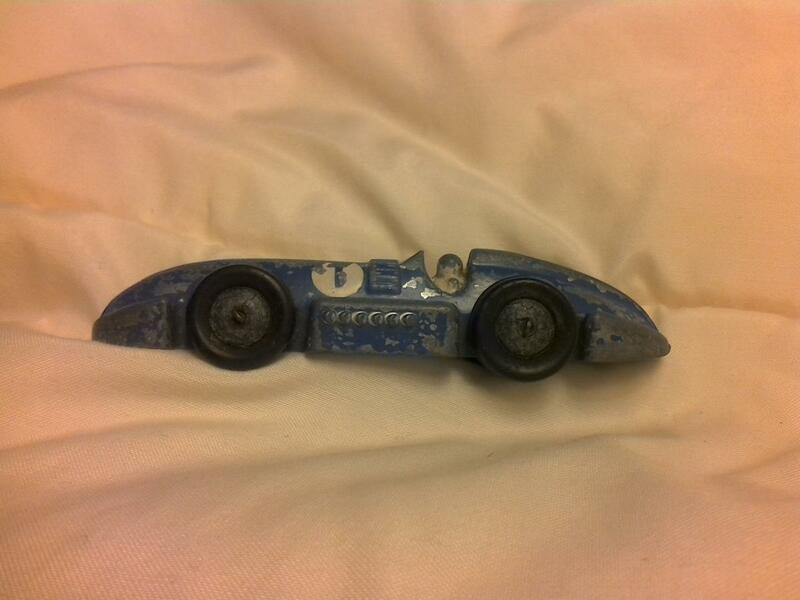 I, on the other hand, remember how badly I treated my Talbot Lago in the school playground. This one I SHALL look after. I was just browsing ebay and what should I see? A badly repainted and very chipped 23e. 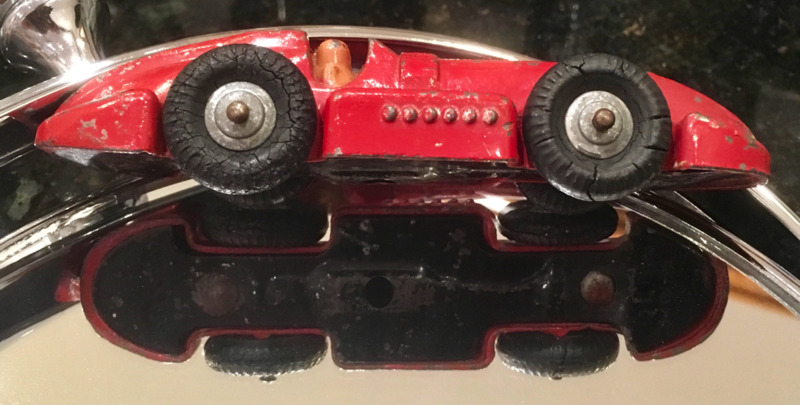 It was obvious straight away that it had pre-war wheels and a quick jump to the photo of the underside showed that it was indeed a pre-war model - complete with baseplate! With a buy-it-now price of £9.99 I couldn't hit the button too quickly. 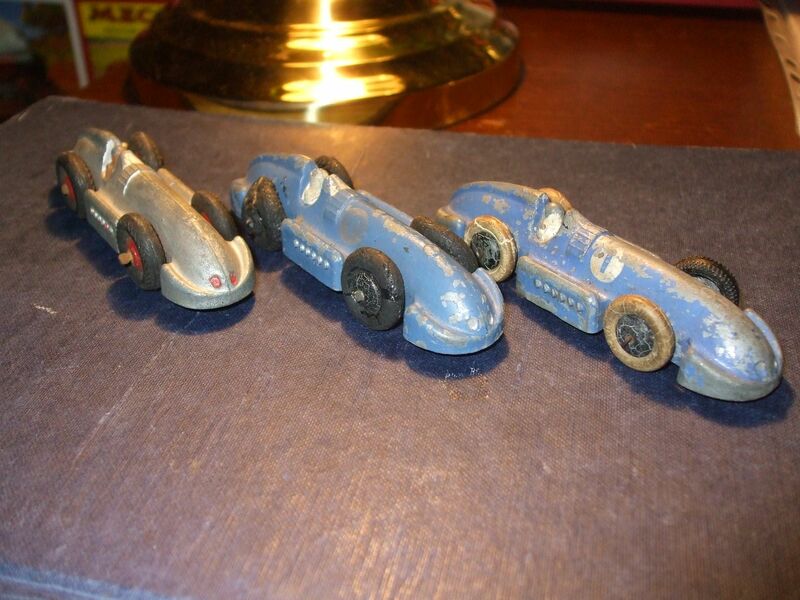 It's now mine and will join the little band of not very pretty, but extremely enjoyable pre-war racers and record cars in my collection. I still haven't told everyone (except Walter) about my other recent pre-war find. I'll get some photos up soon.